Key Specifications (Click on Data Sheet Above for Additional Details) . Very low frequency equipment test lead cable assembly PE3501LF-12 from Pasternack is manufactured to a high standard of quality. This Pasternack RF test lead is built with a BNC cable connector on side 1. Our BNC test lead assembly has a alligator connector on side 2. BNC to BNC RF test equipment lead cable is manufactured with male gender for side 1 and clip for side 2. BNC male to alligator clip cable test lead for RF is constructed with RG58 cable and the impedance is 50 Ohm. PE3501LF-12 BNC male to alligator clip test equipment lead using RG58 cable has a 12 inch length. Pasternack BNC to alligator RG58 very low frequency cable test equipment lead is part of over 40,000 RF, microwave and millimeter wave components from supplier Pasternack. 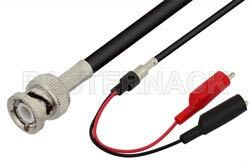 Our test equipment lead with BNC to alligator connectors and RG58 cable is in-stock and Pasternack is where to buy your breakout test lead cable for same day shipping throughout the United States and internationally, as with all other Pasternack radio frequency parts. Custom low frequency equipment test lead cable assemblies can be built and shipped quickly from our Irvine, CA location in the United States.